To begin with I must note that this entry is being written some time after the experience. The internet in Peru did not serve me well and in fact prohibited me making posts to this blog. As such I am forced to write about my experiences from the comfort of the United States. Our trip to Machu Pichu was inevitable. One does not visit Peru for what was the first, and possibly last, time in ones life without taking the trouble to visit one of the most extraordinary ruins in all of South America! After solidifying the complex bus reservations, coordinating train tickets, and finally hostel arrangements we prepared ourselves and set forth. Our journey began in another one of the ever present Peruvian van buses. We, along with several tourists from varying nations, set out and soon left behind the smog of Cuzco. As we drove through the highland countryside, jagged snow capped mountains loomed in the distance. They were the vanguard of the Andes, and we would soon find ourselves amidst these sheer granite guardians of South America. Our first stop was in the small unpronounceable town of Ollantaytambo. An ancient Incan resting area it have massive terraces covering the hillside, along with more decorative ruins dotting the arid, and nearly sheer, hills. We were still at a high altitude and the sky was without much cloud. After spending time walking around the town, exploring the local markets, and witnessing the butchers at said market cut a cow head in half, I bought myself a drink before heading down to the train station. Soon we found ourselves amidst a flock of peruvians and tourists trying to get the train to Aguas Calientes, the town at the foot of Machu Pichu. We boarded and began the ride down through the mountains. As our train followed the path of a river down through the mountain the scenery slowly changed. With the dropping altitude plants took advantage of the greater oxygen by growing in profuse abundance. Soon we were rolling through beautiful rain forest by a sky blue river. Huge granite mounds stood all around us, covered in their green foliage. The beauty was all I saw as we rode through the forests for a few more hours before reaching our destination. Soon we would be preparing ourselves to see the ruins set amidst this jungle. The long road to Machu Picchu was mostly made troublesome by all the arrangements that had to be made beforehand: from the bus to the train to the hostel to the bus to the site. After picking a van from the crowds of drivers yelling “Ollanta?! Ollanta? !” we winded through the roads of Peru where lanes and turn signals are only a suggestion. Upon arrival into Ollantaytambo we separated for a few hours and met for the train after having a Pisco Sour in the local bar by the train station. The train was beautifully new and full of tourists from all over the world trying to find their way to the site of anticipation. Upon arrival into the next city Aguas Calientes, which lies at the foot of Machu Picchu we decided to wander by the tracks and into the jungle. The boys took off to climb things and fulfill their male inhibitions and i sat in a clearing by the river where couples go to be alone. Upon sitting i could find that nothing was comparable to the sights of the mountains that reached heights that seemed to caress the skies. We rested that night and awoke the next morning for a 4am breakfast that would start the trek to the bus up the mountain and to the bottom of the site. The excitement could be felt as the people bustled in from all over to enter the Inca site. As we reached the top or bottom depending on where you choose the beginning to be, not much could be seen from the fog of the early morning. We separated again and i went off to find the Inca bridge. I headed out towards the signs and soon found myself in hardly wide enough paths of stone that led me down to a closed bridge. I didn’t even second guess the heights until i returned later that day as the skies had cleared to see the depths below the cliff i had previously walked down. The incredible heights and beauty of structures upon them were unlike anything explainable. Even after having taken pictures and looked upon them later, the sights don’t seem to be awesome as the feeling they brought while being amongst them. The people were all so kind and it felt as if we mostly shared a sentiment after having hiked throughout the site all day. As we headed down in the bus again it was almost overwhelmingly sad to leave such beauty and wonder when and if my eyes would lay upon such sights again. 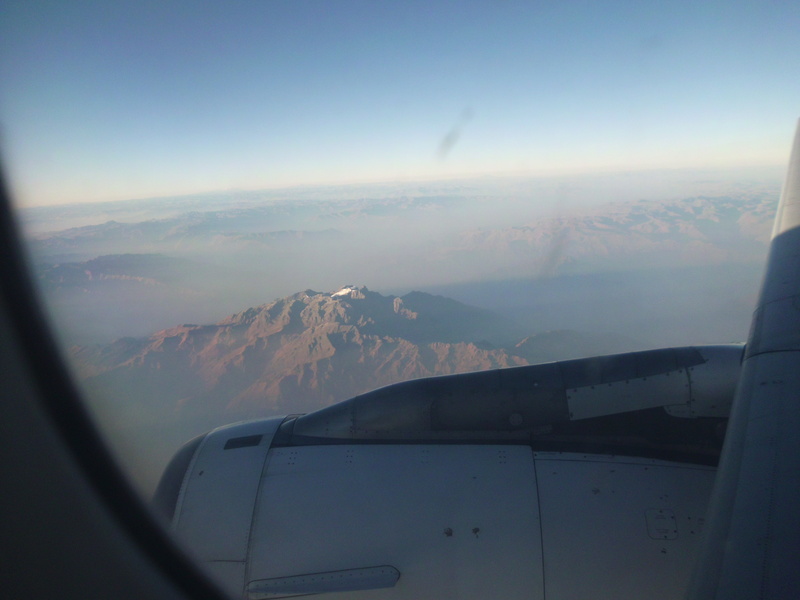 Upon arrival back to Cusco there was an amazing feeling of being home again and sleep that night was unlike any other. However, Machu Picchu, you and I will meet again. I write this blog at about the halfway point of our archeological project here in Cuzco, Peru. So far this has been an experience unlike any other as I find myself in the midst of the bustling cultural capital of the Peruvian highlands. Far from my previous journeys Peru is a much more earthy and less flashy country that is doing what it can to get by. As a “gringo” I am targeted left right and center by trinket sellers, beggars, fake art sellers, and even restaurant waiters trying to ring in customers. Currency is frequently inspected for signs of counterfeiting and shady figures on street corners and near banks keep their eyes on the unwary. As I have been working on my Spanish (or Castelleano as they call it here) I have learned ever more sarcastic ways of turning them down. During the week when fewer tourists are about I tend to attract less attention from the scrupulous natives. When wearing our pot dust caked work clothes we attract less attention than the flashy backpacking, short shorts wearing tourists that wander around in packs not knowing which way is up. American and European women are particularly conspicuous for their trousers (or shorts), money, and air of independence that is considered unthinkable by the traditional Peruvians. The city is a jungle of wires, cobblestones, warn down adobe, Spanish tiles, ancient Incan walls, and dirt. Dogs exhibiting varying degrees of life adorn the dusty doorsteps of the more prosperous shop owners, and can often be found wandering the streets at night, intent upon their mongrel business. When it rains the adobe and gypsum walls disintegrate by small increments, producing the ever present dirt and dust in a city that has almost no unpaved surface. The smell that at first offends ones nose soon becomes unnoticed as it permeates you and your belongings. I know I must wash my clothes first thing upon my return. Occasionally one comes across a happy game of “empty plastic water bottle soccer” that the children in this city are very fond of. Native women from the countryside are easily noticed in their out of place traditional skirts, hats, and hairstyles that have not changed for at least two hundred years. The little country girls (similarly adorned in colorful skirts and long braided hair) that often accompany these “cholas”, as they are called here, are often wide eyed and shy at the bustle and noise of the city. This is a country where strong tradition clashes with the struggle to modernize, and where a few miles outside of town is equivalent to a few centuries of difference in lifestyle. Open air markets entice one with their aromas of meats and soups that would spell days or weeks of intestinal agony for any tourist hapless enough to indulge in such street food. It is definitely a different world from the US or Europe, but life finds a way. Here in this exotic land the people go about their lives knowing nothing better than what they have except for what they can wring from gringos. I am enjoying myself thoroughly and by now feel quite at home weaving my way through narrow streets and dodging the dirty overcrowded vans and bugs that crowd the Peruvian streets. My Spanish is always improving and I am becoming ever more comfortable amongst the people of these highlands. Even the thin air is compatible with time to adjust and a morning cup of coca tea! Though we are about halfway through our time here there is still so much to do and see. Soon we will be visiting one of the most famous ruins in the Americas. Shipwrecked, stranded, day eleven: 20th August, Two Thousand and Twelve. The sun is hot, the nights cold, we are constantly haunted by infernal pounding. I fear the time passes too quickly and the pottery-gods are closing in… Must keep working. The native population seem fairly calm, but become hostel at the sight of coin, for which they promise to give you all kinds of services—from shoe shines to massages—in return for the small-valued currency they seem to use down here. There also seem to be occult worship of geese every Sunday where all the children and youngsters take large and high steps through the center of the village. The local population have these mal-fangled contraptions in the shape of Beetles, or bugs, with four wheels which speed around like cars, and try to hit you when you cross the street. The local food is quite adequate, and mostly interesting and delicious, seeming to be drawn from all corners of the globe. The streets are exciting and full of life. On the Saturdays and Sundays one can see many other fellow stranded travelers from many ships from many countries, but mostly during the week one only sees the indigenous population. In all, this is the most agreeable of spots in the best of all possible worlds in which to be stranded. I would most gratefully exchange many things from home for the things here, and believe this to be the most enjoyable of ventures. Its been more than a week since the big arrival day into the city carved into the valleys that lie between the Andes of Peru…or Cusco. Between the exploring and the altitude, panting has become a regular activity. However this has yet to stop the Cusco gang here from running up stairs, climbing natural rock formations, nor skipping down Av. Pardo arms linked singing “We’re off to see the Wizard.” Between adventures in the city have been adventures of the past hidden in Body Class III sherds from Chokepukio. These adventures have been some of the greatest as they have introduced us to a mummified dog and a monkey jar. They have also been the cause of some lab fever that has encouraged us to analyze everything we can lay our eyes on with the typology including our own typology stylized creation made of andean bread. The constant threats of rain and burning sun however have kept us up and about with attempts to close and open windows upon nature’s whim. We soak up the sun like turtles during tea breaks and hide from it as it slowly climbs over the neighboring buildings and burns through the windows in the afternoon. We do however know the schedule now as it has become as regularized as the constant sound of whispering panpipes in all of Cusco. As our lungs and stomachs slowly adjust with the tastiness of coca tea and comida tipica of Peru I hope we do as well into this space where we can learn an incredible amount from the pottery as well as from the people. The advantage of using the ground as the lining is that you don’t have to worry about compatability between the lining and the earth. However, the ground still needs to be relatively dry before firing so that the leather hard pots don’t absorb ambient moisture. This is most likely to happen as the kiln heats up and the walls of the ware chamber start to steam. The other issue is spalling of the wet clay, shooting chunks of clay from the walls to the pots. To prevent either of these problems, we conducted a drying fire in the open kiln. We built a small fire in the ware chamber and let it burn for about 3 hours, to dry off as much water as possible. 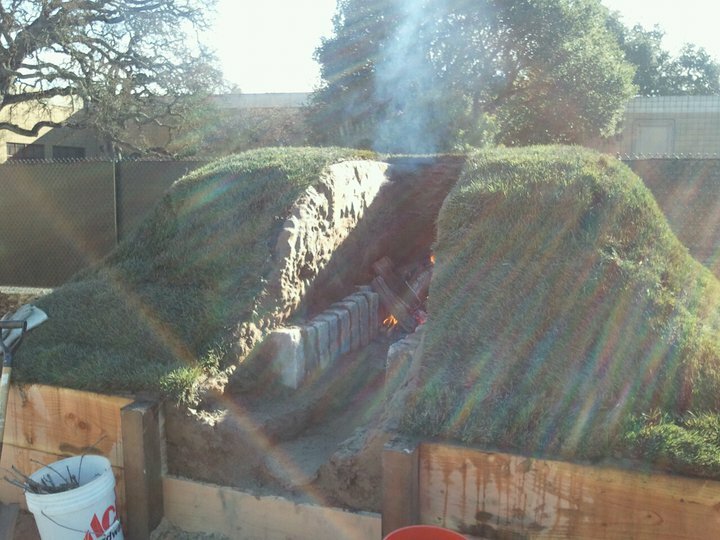 The dryness of the tunnel walls was less important because the tunnel will be roofed with layers of sod. With a great deal of rain in the forecast over Christmas break, we went to lengths to keep the clay mountain mound well-covered. 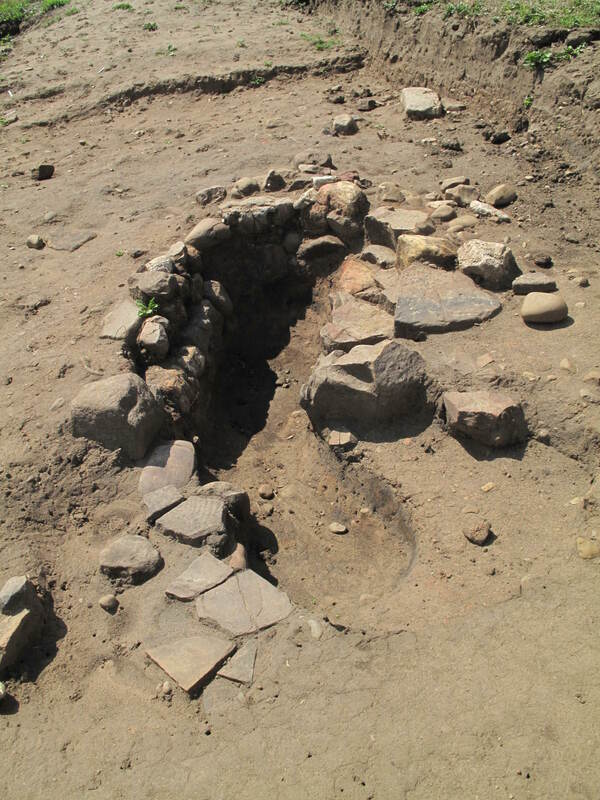 We pulled a canvas tarp over the entire mound and anchored it with granite cobbles along the sides and corners to keep water from puddling in the ware chamber. The other challenge was in keeping the sides of the excavated area from caving in, particularly higher up near the top. To secure this area, we place two boards on each wall and wedged braces in between. In the end, both solutions worked quite well. In keeping with the various kiln reconstructions found in Britain, we opted to use turf, cut into strips or bricks, to constrict the opening over the ware chamber. Sod was the closest available relative, although considerably thinner than sod. We were prepared to have a quantity of sod on hand when we removed the tarp and found that various seedlings had sprouting in our clay mixture, indicating that enough soil was present to sustain plants! We took this opportunity to landscape the mound. 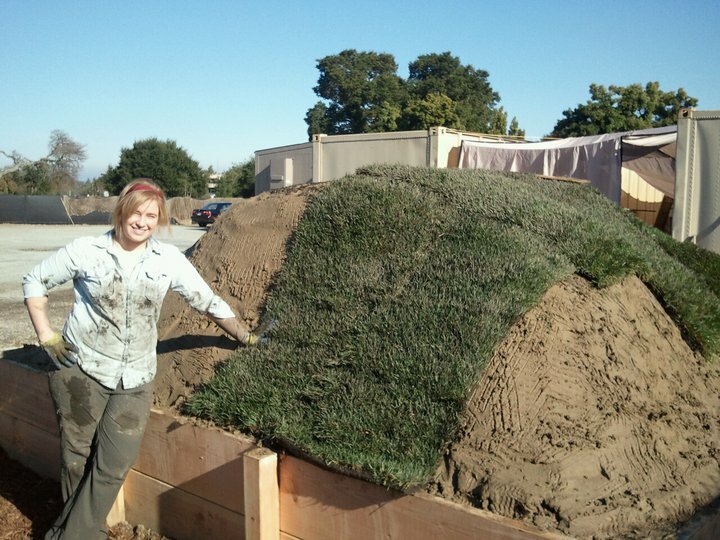 Kate Rose, an undergrad, proved invaluable in heaving the sod on top of the mound and unrolling the heavy sod rolls down the side of the mound. The mound surface was scored using a rake and wet down a bit to prime the surface. Crambeck fire tunnel (Fig. 24, Corder 1928, in Wilson 1989). The term “flue” is not in its common usage here. With the kiln fully sodded and the granite cobbles making the interior ledge, we are almost done! The remaining parts are the clay bars to make the ware chamber floor and the roof of the fire tunnel, and install thermocouple ports. Participants have become attached to our kiln!